Research Data Alliance : Data Management Framework : What Makes It So Special? Data is revolutionarily changing the way research is being conducted, and the Research Data Alliance (RDA) - through its multi-disciplinary, community-driven, and truly bottom-up approach - has a huge impact on this. Since 2013, RDA keeps building - in a very concrete way - the social and technical bridges to enable data sharing and reuse in different communities of practice, to reduce barriers to data sharing and exchange, and accelerating data driven innovation worldwide. With 6769+ members globally, RDA comprises individuals, organizations and policy makers representing multiple industries and disciplines. Who is RDA? This can also be traced in each RDA plenary meeting and it is always remarkable to note, how enthusiastic RDA engaged members are - when they come together from all over the world - to jointly work upon the data-related issues, to support reproducibility, credibility and impact of knowledge generated on data. The RDA11 - under the theme "From Data to Knowledge" – took place in Berlin, Germany, from the 21st to the 23rd March 2018. This international, trustworthy forum welcomed 80+ Interest Groups/Working Groups & BoF sessions, with 661 participants from 41 countries, to discuss the opportunities and challenges of a global data ecosystem of best practices, standards and interoperable data infrastructures fostering cross-disciplinary knowledge and innovation. To date, RDA has released 22 flagship data-related outputs (in form of Recommendations, Supporting outputs) which are official, endorsed results of RDA. RDA outputs should be developed by each RDA Interest, respectively RDA Working Group. Different RDA “flagship outputs” have been already adopted by data infrastructures in different countries across the globe. For example, the RDA FAIRsharing WG final outputs (recommendation and related registry) has already lots of formal adopters [here an example of what is called a FAIRsharing ADOPTER]. This is also the case of the RDA Wheat Data Interoperability WG of the IG Agricultural Data (IGAD) that has released Wheat Data Interoperability Guidelines, Ontologies and User Cases to help researchers create, manage and exchange wheat (and other) data. 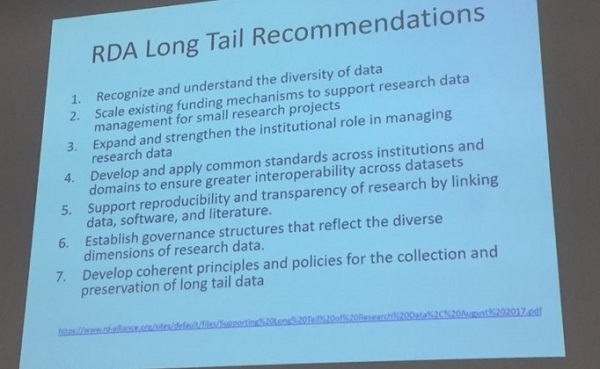 RDA individual members may take control over released recommendations to test them as tools and guidance against different data management (including data sharing and interoperability) issues. Additionally to being to linked to ways and processes of working with data, open RDA outputs link also to national policies (through national RDA nodes), thus facilitating cross-borders communication across e-infrastructure, scientific, publishing and scholarly services. In Europe, for example, RDA recommendations have turned fruitful in driving the efforts for making open science a reality through European Open Science Cloud (EOSC) [see GO FAIR: a bottom-up international approach]. 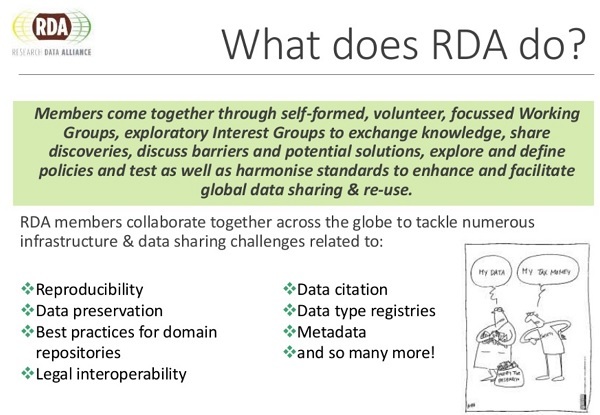 Through robust knowledge sharing and methodological guidance, RDA helps improve efficiency of data management processes around complex and dynamic data workflows, to adhere to FAIR principles across types of organisations (public, research, and also private [see: Report: RDA EU Data Innovation Forum, 2018]) and across different disciplines and sectors. What and Why FAIR data? Easier said than implemented?